An average of 1.4 million viewers watched the toy extravaganza from 102 countries, including the Cayman Islands, Jamaica, and Nepal. 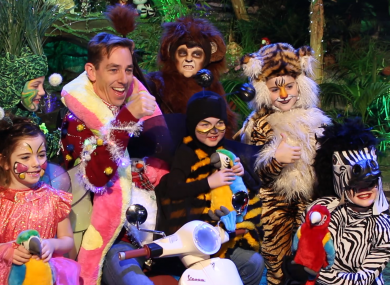 THIS YEAR’S LATE Late Toy Show was the most-watched programme on Irish television to date, with an average audience of 1.4 million viewers watching the show from beginning to end. When you look at those who tuned in for at least one minute of the show, figures jump to more than two million, while on RTÉ Player, this year’s Late Late Toy Show was watched in 102 countries outside of Ireland. Live streaming of The Late Late Toy Show was up 63% on last year, with people tuning in from the Cayman Islands, Lebanon, Jamaica, Qatar and Nepal. The top five countries streaming internationally were the UK, US, Australia, Spain and Canada. Four in five people watching television at the time were tuned in to The Late Late Toy Show, with 77% of Irish TV viewers choosing to watch the show. This year’s Toy Show was more popular than last year’s – which had its highest TV audience since 2011. Late Late Toy Show host Ryan Tubridy said he was “really happy to see that people appreciated it in such tremendous numbers”. The Jungle Book-themed show featured more than 320 young performers and toy demonstrators with surprise guest appearances from Dermot Bannon, Jamie Heaslip and Rory McIlroy. An average of 152,200 people watched the entire show when it was repeated on RTÉ One on Sunday. Channel controller RTÉ One and RTÉ2, Adrian Lynch said: “The fact that four in five people watching television in Ireland at the time were tuned in to the Toy Show demonstrates how much it really connects with the audience. “This is event television at its best and with more than 90% of children watching TV at the time enthralled by Ryan and a cast of hundreds, it really marks the start of the festive season”. The figures quoted by Lynch are based on the average share of 91% of 4-14 year olds who watched the show. The Toy Show figures arrive just weeks after RTÉ announced it would outsource children’s programming to independent contractors, resulting in job losses and the end of live children’s programming on the public service broadcaster. The decision has been put on hold pending discussions with RTÉ’s trade union, the TUG. Speaking to TheJournal.ie in the run up to this year’s Toy Show, Ryan Tubridy said children’s programming was really important to RTÉ. All toys featured on the Toy Show on the night will be donated to charity, and a list of all the toys featured is available on the show’s website. Email “Friday night's Late Late Toy Show is this year's most-watched Irish programme”. Feedback on “Friday night's Late Late Toy Show is this year's most-watched Irish programme”.